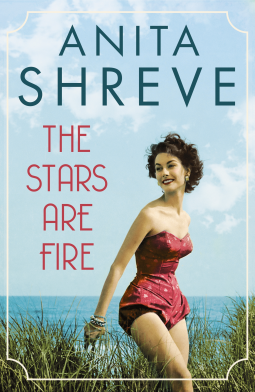 I really wanted to like The Stars are Fire, Anita Shreve’s latest book. However, I don’t think it’s one of her best books and I’m not keen on the cover, which I think does not represent the story. It begins well, describing the continuous wet spring when it seemed the rain would never stop and Grace Holland prays for a dry day. She’s in a difficult marriage, with her two young children, both under the age of two and pregnant with her third child. They live in a shingled bungalow two blocks in from the ocean in Hunts Beach (a fictional town) on the coast of Maine. The rain is followed by the long hot summer of 1947, then a drought sets in, followed by devastating fires. The Stars are Fire paints a convincing picture of life just after the Second World War. Grace’s daily life is difficult constrained by the social conventions and attitudes of the late 1940s. The fires are getting closer to Hunts Beach when Gene, Grace’s husband joins the volunteers trying to bring the fires under control and she is left alone with the children. Grace’s strength and ingenuity is tested as she and her children survive the fire only to find that everything around her has gone – all the houses, her best friend and neighbour; those who have survived are leaving and her husband is missing. She has nothing. Grace, however, is resilient and resourceful. Helped by her mother and strangers she begins to build a new life, finds work and experiences a freedom she had never known before. But then it all changes. I don’t want to write any more as I don’t want to give away any spoilers. The Stars are Fire is easy reading and I finish it in one day. It is written from Grace’s perspective and in the present tense, which I often find irritating. But it is a page-turner and I did want to know what happened next. I didn’t enjoy the second half of the book as much as the first. And I think the ending rather trite. It’s a book about loss and grief, about how people’s lives can be changed in an instance and how they react and face up to emotional and physical challenges. My thanks to the publishers and NetGalley for a proof copy of this book. Author MargaretPosted on April 18, 2017 Categories Book Reviews, Books, e-books, Fiction, Historical Fiction, Review CopyTags Anita Shreve, The Stars are Fire. I’ve read a couple by Anita Shreve, The Pilot’s Wife and one other, the title eludes me naturally. I liked the former, the latter was so-so. I haven’t felt enthused to get more books by her to be honest and I’m not sure why. Sorry this one wasn’t as good as you hoped. I liked The Pilot’s Wife too. I’ve read most of her novels ages ago and I think the later ones just haven’t been as good as the earlier ones. I was hoping this one would be one of the better ones! I’m not enthused any more. I’m not the biggest fan of the present tense, either, Margaret. The premise of the story sounds interesting, though, and I can see how you’d have enjoyed the first half of the book. Thanks, as ever, for your candor. I’ve always been a fan of Shreveport and have read all her books, except The Pilots Wife! Somehow that one has evaded me. I wasn’t impressed with Stella Bain, I agree something is missing in her writing as late. I will still read this one though, it sounds interesting.